A number of friends and acquaintances have been telling me in recent days about how much they enjoyed seeing Jodi Huisentruit’s story re-told to a national audience once again on Investigation Discovery’s recent airing of Disappeared. It has been years since the story has been featured on national television. Here at FindJodi.com, we feel the more the story gets play in the media, the better the chance that somebody, anybody, will come forward so we can finally put Jodi, and this ongoing search story, to rest. My 2011 book, Dead Air, is dedicated to that end, as well. When I learned the producers of Disappeared were planning to use video re-creations of the story, I’ll admit to being a bit dubious about it at first. Most re-creations I have seen on other shows have not been, in my opinion, well done. But, while watching the airing of the January 28 show, I was pleased to see that producers did an artful job of mixing their re-created video with the 1995 archived news video. I was especially glad to see Sarah Kohn of Rochester portraying Jodi in the re-creations. As you may recall, Sarah is the actress who portrayed Jodi in Gary Peterson’s screenplay Fade to Black, which opened last summer in Spring Valley, Minnesota. Sarah so completely embodied Huisentruit on stage, and as I wrote at the time, when she screamed, it was as if I heard Jodi herself. 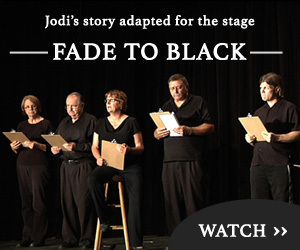 Fade to Black is now available to view on this site, and our team simply asks for a minimal donation to help keep the search effort alive. Thanks for your support, and please keep your comments coming! I got together with a couple of folks at their house who had lived in Newton and we sat and ate popcorn while watching the TV show. I think it was nicely crafted, too. As I type this Jodi’s “Disappeared” episode is airing on Investigation Discovery here in the UK. Disappeared is one of my favourite shows on ID and the Crime & Investigation channels as it’s never sensationalist, it just creates an analytical, methodical timeline of the events and the missing person’s life. I’m sorry to see she’s not been found yet. I wish you all the very best in finding Jodi one day – maybe even with the help of repeat broadcasts of this show.